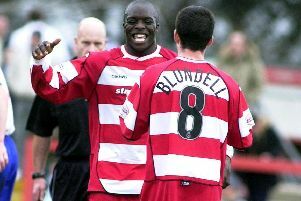 Andy Williams celebrates scoring against Chesterfield. Andy Williams says tomorrow’s trip to League One leaders Coventry City will be a good barometer for resurgent Doncaster Rovers. Rovers have won five games out of eight in all competitions since Darren Ferguson became boss. This weekend Doncaster face a Coventry side who are unbeaten at home and boast the division’s top scorer in on-loan Newcastle United striker Adam Armstrong. And Williams says it is a game that could reveal how far Rovers have come under their new manager. “Right now it’s the toughest test you could get in League One,” said Williams, who has scored five goals in his last five games. “Obviously they’re top of the league and looking like a really good outfit. “It’ll be a really good test for us to go there and see exactly where we are in terms of league standings. Rovers’ four league wins under Ferguson - against Shrewsbury, Colchester, Blackpool and Chesterfield - have all came against sides currently in the bottom half of the table. Two of their three league defeats were against teams currently in the top half, Peterborough and Millwall. However, Williams insists he does not read too much into league positions. “Anyone can beat anyone in this league so I don’t think you can ever go into a game expecting to win,” he said. Luke McCullough, Gary MacKenzie and Harry Forrester have returned to training.